It was ejected from my computer the day of its original deadline, sidelined while the photographer waited out the last days of a difficult pregnancy, lost not one but two excellent marketing managers, and caused me more headaches and sleepless nights than any normal person would willingly tolerate. 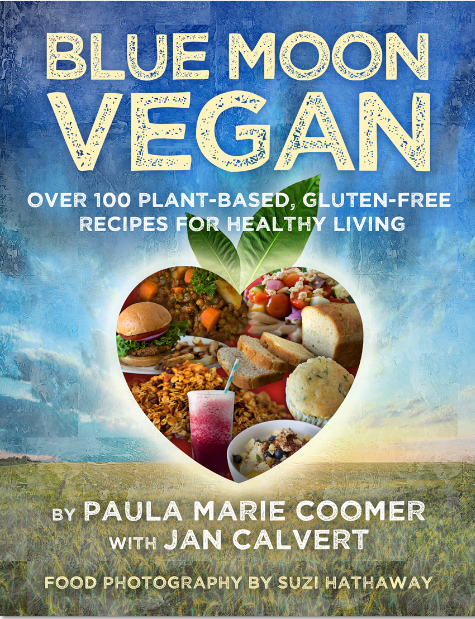 But it is starting to look like Blue Moon Vegan will truly appear sometime in the next few months, although we do not yet have an exact release date. Suffice it to say all involved will be glad, proud, and relieved, but the bounty belongs truly to anyone looking to expand his or her culinary horizons with a great collection of original vegan/gluten-free recipes ranging from Everyday Grilling Burgers to Squash Blossoms in Cashew Cream. There are breads, cookies, snacks, breakfast fare, cocktails, and smoothies. There are soups, salads, and main dishes, tortillas, and burger buns. Learn how to make your own gluten-free flour mixes from Bridge Baking’s Jan Calvert. Make “Can’t Be Cheese” from sprouted almonds and coconut milk. Shore up your afternoons with Cherry Power Balls and your Sunday mornings with Cherry Oat Sunday Cake. Make your weekend outings easy with sandwiches made of Chick Salad or Five-Bean Sandwich Spread. Remind yourself how lucky you are to have the resources to make such choices about your eating. Become conscious of the world around you and your responsibility to demand more from food producers and government. Grow your own herbs. Dry your own apples. Cook your beans from scratch. More to come in the days and weeks ahead, so stay tuned! I’ll be sharing recipes, tips, and ideas for ways to make food and food preparation central to your living, your health, and your happiness.